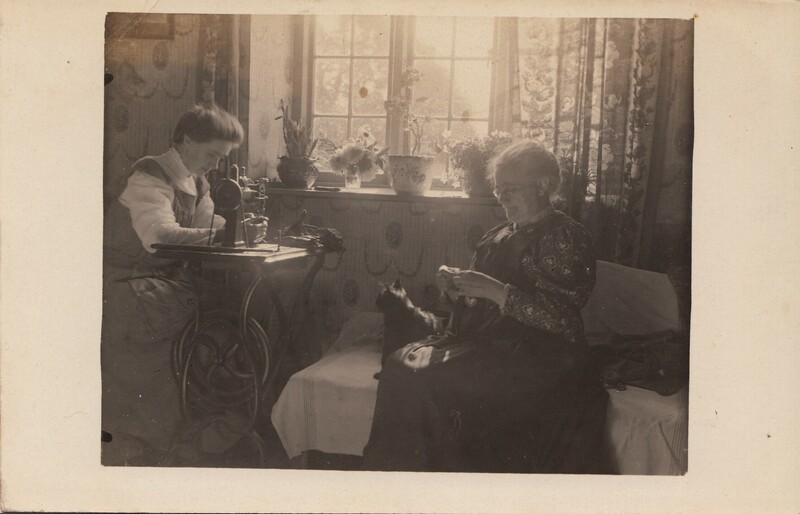 Unidentified women with cat. Real photo postcard, American, ca. 1910. Photographer unknown. Not mailed. This is such a lovely image; I wish I could identify the women and the place where the snapshot was taken. I think that the flowers in the glass on the windowsill are peonies; if so, the photo was taken in late spring. The houseplants are looking a little scrawny, so they may have come through a long winter indoors. The woman at the sewing machine seems to be involved in threading the needle. She is being watched by the plump black cat seated at the right elbow of the older woman, keeping company on the sheet-covered chaise lounge as sun streams in the window. It’s just a work day at home.